The HLA gene regulates our acquired immune system. It is what helps our body identify foreign antigens (bacteria, fungi, viruses) and determine what type of white blood cells and antibodies should be produced. Depending on our HLA type we are more or less resistant to certain diseases and infections. HLA also influences our risk of developing autoimmune diseases like diabetes, multiple sclerosis, rheumatism, arthritis, hypothyroidism, psoriasis, Celiac disease, Crohn's disease, fibromyalgia, and so on. You can compare the distribution of HLA-DR alleles by country to get a better idea of where each type is more common. To better visualize regional variations, I have started making maps for each HLA-DR type. Here are those that I have already made: HLA-DR1, HLA-DR3, HLA-DR4, HLA-DR7, HLA-DR11, HLA-DR15, HLA-DR16. You can know your HLA types through a blood test, i.e. serotype (ask your doctor), or checking the raw from your DNA, i.e. genotype, if you tested with 23andMe, and in some cases also with Geno 2.0 or FamilyFinder. Some alleles are not tested by any of the three companies though. I have found a list of SNPs for all common European types, but unfortunately I do not know which allele is positive for some SNPs. If some of you have more information, make sure to share it. There are subtypes for each HLA-DR type, although most of them have only one common subtype in Europe. HLA-DRB*0101 means essentially the same as HLA-DR1. To be more accurate it is subtype 1 of HLA-DR1, but it is the only subtype found in Europe. The highest diversity of subtypes in found within HLA-DR4, although non-Mediterranean Europeans usually belong to HLA-DRB*0401. The positive allele is indicated in brackets/parentheses. You will need to be positive for all SNPs listed in the same row to belong to one HLA-DR type. Each person normally belongs to two HLA-DR types (although it is possible to have twice the same). The most common subtypes are indicated in bold. I have tried to geographically match the colours of HLA types to the colours I used for Y-DNA haplogroups. For example, HLA-DR9 is most common in North Asia and among Finno-Ugric people, so I used purple like for Y-haplogroup N1c. 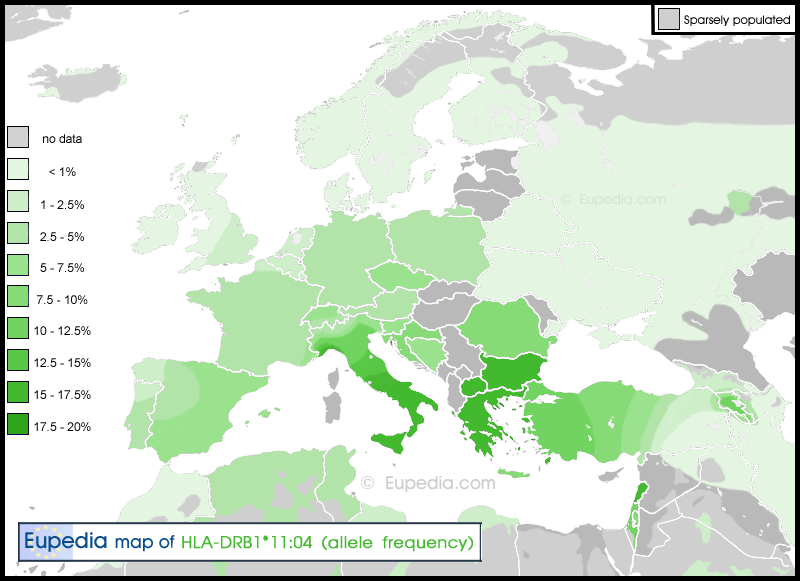 HLA-DR11 peaks in West Asia, Greece and Italy, so I used green like for Y-haplogroup J2. I couldn't always find a correlation with Y-DNA, so I sometime used colours used for mtDNA or autosomal maps, as in HLA-DR15 which is orange like the ANE admixture. Note that HLA-DR2 doesn't exist anymore. It was split into DR15 and DR16. Likewise HLA-DR5 was split in HLA-DR11 and HLA-DR12, while HLA-DR6 was divided in HLA-DR13 and HLA-DR14. Depending on reading directions your DNA test, the letters of the alleles might different. Just remember that C=G and A=T. Last edited by Maciamo; 26-01-16 at 18:57. Very interesting, Maciamo. In making my way through the data, I did notice that there seems to be a discrepancy between the 8.7% DR 11 figure for Turkey in the chart and the map showing frequencies in Turkey over 25%. Also interesting that Northern Italy with only 10% J2 still shows the correlation with DR11. I've thought that perhaps there was a trade off: a higher frequency of certain auto-immune disorders for better adaptation to wheat. In terms of actual disease frequency for something like RA the correlation seems to break down, however. I also wonder how the studies which link autoimmune disorders to Neanderthal introgression fit in. Oops, sorry about that. I checked again the data and 8.7% was only for HLA-DR11:01. The total for DR11 in Turkey is 21% (but 26% in Kurdistan), with a peak of 35% in East Thrace (which also happens to be the region with the highest frequency of J2). Perhaps the correlation matches more the West Asian admixture than J2 itself. It makes sense since HLA is an autosomal gene and would spread through both male and female lines, while Y-DNA get skewed according to historical events that impacted male lineages (wars, conquests, royal/noble lineages). Then it's important to look at the subtypes too. For examples the Kurds and Azeri's DR11 subtype is almost exclusively DR11:03 (20.5% and 18.5% respectively), but DR11:03 is otherwise extremely rare elsewhere. It is only found with a frequency above 2% among the Uyghurs (4%) and in Saudi Arabia (3%), central/northern Italy (2.5%), and Crete (2.5%). DR11:01 is mostly found mostly in Iran (ethnic Persians especially), Ukraine, Belarus and northern-central Italy. The wide Eurasian distribution, the peak around Ukraine and the fact that DR11:01 was found among Yamna and Corded Ware people strongly hint at an Indo-European dispersal. Proto-Indo-Europeans may have inherited this HLA via their Caucasian admixture, as Georgia is also a hotspot. The higher frequencies in Ukraine, Belarus, Iran and North India suggest that a positive selection for this HLA took place in the Indo-Iranian population (with back migrations to eastern Europe with the Sarmatians and Scythians). In Italy, DR11:01 correlates with R1b-U152. I have made a new map for this subclade to make the explanation clearer. DR11:04 is the variety found throughout the ancient Greek world and the Levant suggest a link with J2a-dominant Greek and Phoenician civilizations. Southern Italy, Greece and Turkey have both varieties, about 1/3 Bronze Age DR11:01 and 2/3 Neolithic DR11:04. I posted the studies about HLA types inherited from Neanderthals and Denisovans here, but the studies only mention HLA A, B and C, not DR. I couldn't find any information about Neanderthalian HLA-DR. However I checked the Denisovan genome and it was homozygous for DRB1*11:03. Both Denisova and one Altaian Neanderthal were also positive for the rs2516049 defining DR09:01 (once again homozygous in Denisova). Last edited by Maciamo; 25-01-16 at 13:11. Thanks again, Maciamo. I was partly just being my normal slightly OCD self. :) Mostly, though, it's just that I have a particular interest in this topic because some auto-immune disorders make a more than average appearance on both my paternal and maternal line. For what it's worth, my mtDna, as I mentioned in another thread, is U2e, which I don't think is a "Neolithic" clade in Europe. I can't find the study now, but I remember one stating there was a cluster of U2e in southern France, so I'm not surprised there's quite a bit of it in nearby Liguria. Perhaps it, as well as this particular type of HLA marker, came to Liguria with the Celts in the first millennium BC. Is it known which of these variations is correlated with auto-immune arthritis/lupus versus something like Type One diabetes, for example? We have the first among women of my family, but none of the second. We also have one case of MS, but it might have been inherited from the non-Italian ancestry (which is Irish). From what I've been told Ireland has high rates of MS. Going back to the frequencies for RA in Europe, any idea why there's such a spike in the Netherlands? Do you know if there's that kind of spike for other auto-immune disorders? U2e seems to have originated in Russia (Kostenki was U2e 35,000 years ago). It is most common in the North Caucasus and the Volga region, and conspicuously absent in regions last/never settled by the Indo-Europeans (Sardinia, South Italy, Basque country, northern Scandinavia, Southwest Asia, North Africa). So it surely came with the Indo-Europeans, and in northern Italy that could have been the Italics or the Celts, or even maybe later Germanic tribes. Yes, if you check the page for DR11, I mentioned the associated autoimmune diseases. But don't forget that you have two HLA-DR types + two HLA-A, two HLA-B and two HLA-C, and all of them play a role in autoimmunity. For example, RA is most closely associated with the northern European HLA-DRB1*04:01, while MS is linked to HLA-DRB1*15:01. People at highest risk of developing type 1 diabetes have one copy of each haplotype. It's difficult to compare medical statistics across studies as they use different methodologies and sometimes have huge discrepancies in sample sizes (say 50 against 50,000). So it could be that the data for the Netherlands is not relevant (too focused on a specific subpopulation, or too small sample size) as it seems completely out of line with the other figures for northern Europe. But otherwise it is to be expected that RA should be higher in northern Europe as HLA-DRB1*04:01 is higher there. NB: I have added maps and updated the descriptions above fro DR11:01 and DR11:04.
does this brown text represent T ydna as per your post #1? I tried to match the colours by geographic distribution. However there is no relation whatsoever between the HLA gene (chromosome 6) and Y-DNA or mtDNA. The relation is purely historical. DR13 is grey-brown as it appears to have been spread by Neolithic farmers (Y-DNA G2a, T1a and in Europe also E1b1b). It's not because your belong to Y-haplogroup T that you will be DR13 ! It would be a coincidence. Anyway your results show that you aren't. Keep in mind that contrarily to Y-DNA or mtDNA, everybody has two HLA-DR types. Even if you are of Italian descent, you could have an HLA-DR type that is typical of Siberia (although it's less likely obviously).